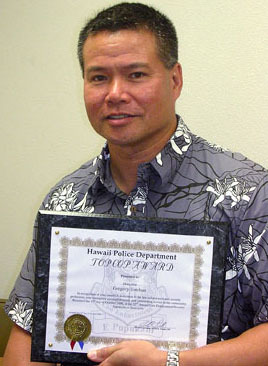 The Hawaii Joint Police Association has named Detective Gregory Esteban as Hawaii Police Department’s "Top Cop." Esteban received the honor at a luncheon ceremony in >>Honolulu>> on Tuesday, October 31. The 21-year veteran of the Police Department has worked as a detective in the East Hawaii Criminal Investigations Section for the past seven years. His supervisor, Lieutenant Randall Medeiros, said Esteban epitomizes what the department strives for in its employees. 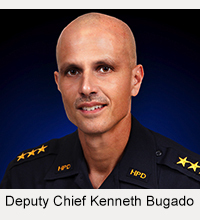 Medeiros said Esteban often takes it upon himself to conduct his own research into emerging investigative techniques across the country so >>Big> >Island>> police officers can use them in their work here. As a result, he is well respected by his peers, who often look to him for guidance. Medeiros also commended Esteban for "effortless supervision" of his unit when Medeiros leaves him in charge and for volunteering to teach classes on difficult subjects. 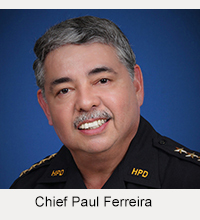 The Hawaii Joint Police Association is a nonpartisan organization representing all phases of law enforcement and private security in >>Hawaii>>.